Most Maine homes are centrally heated with either a boiler or furnace. Energy-efficient options for boilers and furnaces are available for all heating fuels. Efficiency Maine offers rebates and financing for homeowners installing qualifying heating equipment. 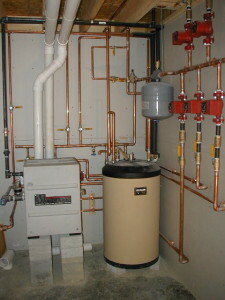 High-efficiency boiler with domestic hot water tank. A central heating system usually consists of three parts: a boiler or furnace to generate heat, a distribution system of pipes or ducts to move that heat throughout the home, and controls, which act as the brain of the system. When assessing the efficiency of a central heating system, all three parts need to be considered. Boiler and furnace combustion efficiency is often measured by Annual Fuel Utilization Efficiency (AFUE). AFUE measures how much of the fuel that goes into the system gets turned into heat in the boiler or furnace. Installing a heating system with a higher AFUE may significantly reduce your fuel consumption. Distribution systems deliver the heat a boiler or furnace creates to your living spaces. Higher efficiencies come from upgrades such as sealing and insulating ducts and pipes, particularly in unheated spaces. As a result of improvements to the distribution system, you may be able to install a smaller boiler or furnace than the one currently in place, further reducing installation costs and energy use. Controls determine how and when your boiler/furnace and distribution system operate in order to efficiently maintain your desired indoor temperature. Condensing: A condensing boiler or furnace extracts heat from the water vapor in combustion gases, getting more “bang for your buck” from the exhaust before it goes up the chimney. Condensing systems can achieve burner efficiency as high as 98%. Modulating Burner: The best boilers and furnaces can vary their heat output depending on the heating demand of the home without having to cycle on and off. A simple ‘on/off’ boiler may be operating inefficiently if it is “short cycling” or turning on and off frequently, which wastes energy heating up and cooling down. Sealed Combustion: Sealed combustion systems bring outside air directly into the unit, and are typically more efficient because they don’t use indoor air for combustion. They also reduce the risk of backdrafts and carbon monoxide leaks. Proper Sizing: Oversized boilers and furnaces cost more to purchase, and cycle more frequently, reducing their efficiency. Duct Sealing: Leaky ducts can significantly reduce comfort and the efficiency of a heating system. Pipe and Duct Insulation: Insulated ducts and pipes get heat to parts of the house where it is needed and minimize losses to attics, basements and crawl spaces, where distribution systems are often located. This improves a system’s efficiency and saves on energy costs. Separate Zones: Separating your home into smaller heating zones can allow you to avoid heating unoccupied rooms. Cold-Start Control: This type of control allows the boiler to cool down when there is no call for heat or domestic hot water. This is especially helpful during shoulder or summer months when there are few calls for heat. Outdoor Temperature Reset: Outdoor temperature resets control water temperature in boilers and other hydronic heating systems. They vary the temperature of the water based on the outdoor temperature to save energy during the shoulder seasons.